French Foreign Minister Bernard Kouchner has arrived in the Iraqi capital Baghdad for a visit at the invitation of the country's president. The trip marks the first time a French minister has been to Iraq since France opposed the US-led invasion in 2003. The election in May of Nicolas Sarkozy as French president brought an improvement in relations with the US. 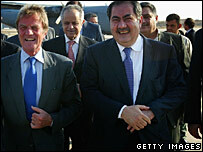 Mr Kouchner said France could offer support to end sectarian violence, but the solution lay in Iraqi hands. "I want to listen to the people... We have to understand this country, we have to understand what's going on between the Shiites and the Sunnis, not only in Iraq," he said in a joint news conference with Iraqi Foreign Minister Hoshyar Zebari. The visit comes four years after the attack on UN headquarters in Baghdad which killed special representative Sergio Vieira de Mello, a personal friend of Mr Kouchner. The BBC's Mike Wooldridge, in Baghdad, says the visit is highly symbolic and shows Mr Sarkozy wanted to create a "clear divide" between himself and predecessor, Jacques Chirac. France has hosted several Iraqi leaders and has given its support to the process of political transition. Mr Sarkozy - who recently had informal talks with US President George Bush - has already said that the US could count on his friendship. The talks took place at Mr Bush's family home in the US state of Maine and some observers remarked that it was impossible to imagine Mr Chirac being given a similar invitation. The two countries are also working together closely on issues involving Iran, Lebanon and Sudan. Mr Kouchner arrives days after a deadly attack in the country killed hundreds of people. The BBC's Alasdair Sandford in Paris says the visit illustrates that France intends to establish a stronger presence on the world stage. In 2003, Mr Kouchner was a rare French voice in refusing to condemn the US-led invasion. He criticised the French stance and said the French had become "America-phobic". Although President Sarkozy has described the war as a "mistake", he has also said France acted with "arrogance" in the run-up to it.